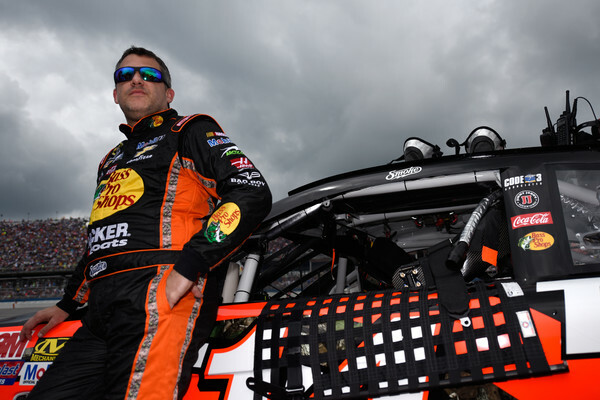 For Talladega- the race on Sunday was fairly uneventful and that was a good thing. ?The big one never came- just a few medium to small sized incidents that did little damage- unlike the big melee during the truck race the day before with 34 laps to go. Tony dropped to the back of the pack after the drop of the green flag and stayed there for the entire race. When – by chance of caution he was in packs of cars he again would drop back until he was in a smaller group of people whom he trusted. ?The plan was to move forward if they thought there would be a chance at gaining position with relatively little danger of being ensnared in “the big one” however even towards the very end of the race Tony radioed in and said that he felt there was something still brewing and he wasn’t going to push it to move forward. ?While a couple of smallish accidents happened towards the end of the race- Tony was never really able to climb forward because of the restarts and finished his day 32nd. It was a craps shoot to stay in the back just as much as it was a craps shoot to get up in the main fruckus and possibly get wiped out by someone else’s problem. Talladega.? It ALWAYS makes me nervous.? The pre-race show did NOTHING to quell my nerves about Dega either.? 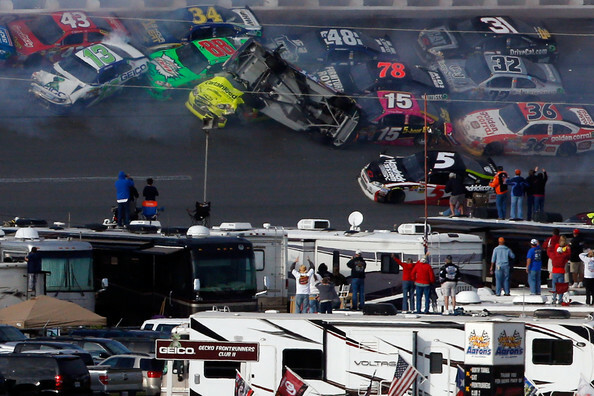 There is always talk about “The Big One” looming- and endless (or so it seems) loops of stock cars flying at unnatural angles into fences (Carl Edwards) and upside down (Ryan Newman).? So the fact that there is always the chance that there is going to be a big, NASTY wreck at some point looming in the back of my mind. As a matter of fact- I had been watching parts of Race Day on Speed before the race (when I say this I mean it was on in one room as I went about my morning chores so I caught snippets here and there) and I just happen to catch Tony Stewart talking to Rutledge Wood. He (Tony not Rutledge) said something that I wanted to talk about here- because I disagreed with it, but I can’t find the interview online and because of the end of race carnage my thought about Tony’s Rutledge interview flew out of my head because the only thing I could think of is “I don’t like seeing the undercarriage of a stock car…anyone’s race car really- but especially not my driver’s undercarriage” and pretty much that is all I can really bring from the race now.? Well that and I don’t care who’s fault Tony says it is- I watched it several times and I still blame Michael Waltrip/Casey Mears. In my opinion the race was typical restictor plate racing: boring except for the last 10 laps or so and then you worry about all hell breaking loose, which it obviously did.? After all the last lap melee that took out several cars, NASCAR determined that Tony finished 22nd. Which dropped him down to 7th in the points. Technically we aren’t OUT of the Championship fight…but it’s not looking promising. Jamie McMurray led the most laps. What surprised me was that he didn’t cause the big one. He seemed like a moving chicane out there going from groove to groove and then back again. I believe it was Jeff Gordon who called him a moving Chicane out there. I don’t know what was going on with DirecTV yesterday. None of my hotpass channels worked AT ALL- they said searching for signal (771). Then in the middle of the race it lost ESPN all together and put up a message about it being an issue with the sun. I would have been more incline to believe the Sun nonsense if other channels had been affected but other channels seem to be fine (well except for the hot pass channels). Maybe the Sun just doesn’t like my NASCAR. Not sure WHAT is going on here but it’s kind of a humorous picture. What do you think is going on? 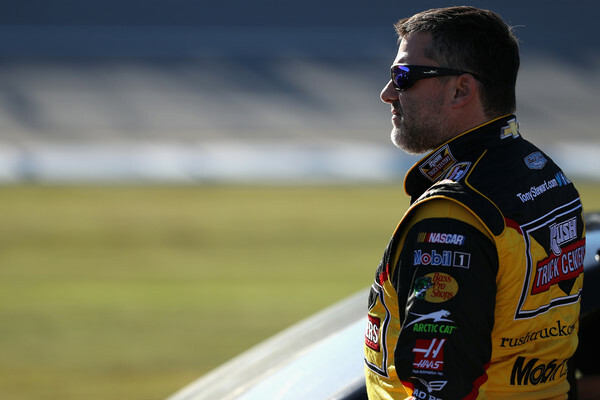 (Shared from TonyStewart.com- click the picture to be taken to the original).